A year on from the sad death of one of popular music's greatest innovators, CNN International's culture show, Icon, is set to pay tribute to Les Paul and the Gibson guitar that bears his name. Thursday 26 August sees the premiere of the show which contains new interviews with Slash, Paul McCartney, Billy Gibbons and Al Di Meola in which the legends discuss Les Paul's enduring influence. Paul McCartney: "Without him (The Beatles) wouldn't have known that there was such a thing as speeding up. So, on early Beatle records we used a lot of those techniques and I think probably Les's influence had made us think of that." Slash: "I met him at Fat Tuesdays in New York in 1990 or '91, or something like that and I got up on stage and I played with him. It was a very humbling moment because he was such a mind-blowingly phenomenal guitar player. To get up and have to improvise along with him was very intimidating. "I wasn't really at the top of my game that night so it was a sort of embarrassing moment but he sort of took a liking to me and we became friends after that so I got a chance to jam with many times over the years and we got to know each other very well. My memories of Les are very fond and definitely one of the most important people that I met in my musical career. Billy Gibbons: "The one I'm still in possession of named Pearly Gates, long story but we thought it had a divine connection because the sound has yet to be... eclipsed by any other instrument. It was just a lucky day where everything was right: the right combination of wood, the right amount of glue, the right temperature, the right amount of spray just came out. And it by no small measure... we consider it an integral part of what created the ZZ Top sound." 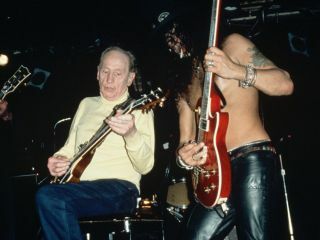 The Icon show also visits NYC's famous Iridium Jazz Club where Les Paul played with his trio until the age of 93 and chats to his son Russ about his father's legacy. Then it's off to the heart of Tennessee for a visit to the Gibson Guitar factory to learn more about one of the most iconic guitar designs of all time. To watch the show tune in to CNN International on Thursday 26 August. Visit CNN to watch a video trailer. Thursday 26 August: 11:30, 16:30. Saturday 28 August: 06:30, 20:00. Sunday 29 August: 03:30, 07:30, 15:00. Monday 30 August: 01:30 (all times GMT).